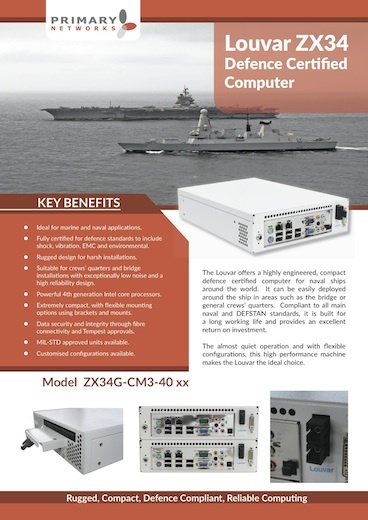 The Louvar offers a highly engineered, compact defence certified computer for naval ships around the world. It can be easily deployed around the ship in areas such as the bridge or general crews’ quarters. Compliant to all main naval and DEFSTAN standards, it is built for a long working life and provides an excellent return on investment. The almost quiet operation and with flexible configurations, this high performance machine makes the Louvar the ideal choice. Ideal for marine and naval applications. shock, vibration, EMC and environmental. Rugged design for harsh installations. Powerful 4th generation Intel core processors. MIL-STD approved units available. z Customised configurations available. Desk mount brackets. optional stacking brackets optional rack mount. either one or two system cooling fans may be used depending on application. Click on image to open the file.